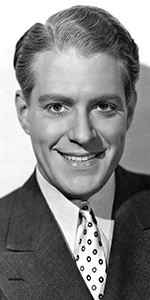 Nelson Eddy was the most popular male musical star in the 1930s. Handsome and dashing, and gifted with an amazing baritone, Eddy starred in a string of hit films with Jeanette MacDonald. Retiring young, he continued to sing in concert settings, and inspired many people to persue singing careers. The only child of middle-class parents, young Nelson began singing in the local church chior, where his father William also sang. Nelson's parents divorced when he was fourteen, an event which was very stressful to the young lad. Nelson and his mother Caroline moved to Philadelphia, where he was forced to drop out of school, finding a job in a plumbing supply company. He later had a series of jobs at various local newspapers. He had a job as a copywriter in an ad agency, but was fired for singing too much! Eddy taught himself to sing by imitating the baritone opera recording stars of the day; he would give recitals for women's clubs to practice singing before an audience. In 1924, Eddy won a singing contest. The prize: a chance to sing with the Philadelphia Opera Society. Music director Alexander Smalles became Eddy's singing coach. And so, Nelson Eddy became an opera singer, appearing in operas such as La Bohéme, The Magic Flute, Pagliacci, and Tannhäuser with the Philadelphia Civic Opera Company. He also found time for the antics of the Gilbert and Sullivan operas with the Savoy Company, playing Genral Stanley in The Pirates of Penzance in 1923. In 1927, Eddy went to Germany to study with William Vilonat. Rather than remain in Europe to sing in opera companies there, Eddy chose to go on a concert tour of America with accompanist Ted Paxson, who would work with Eddy for the rest of his life. By the early 1930s, his vocal teacher was Edouard Lippé — Eddy was constantly looking for new vocal techniques and learning new things. Substituting for Lotte Lehmann at a concert in Los Angeles in 1933, Eddy wowed the audience, and the offers from the film studios started to arrive. Eddy signed with Metro-Goldwyn-Mayer in the belief that his film appearances would be good promotion for his concerts — his contract allowed him to have three months off per year. His first film was an adaptation of the operetta Naughty Marietta, where he co-starred with established film star Jeanette MacDonald (the film played he Chinese in May, 1935). His singing "Ah! Sweet Mystery of Life" became a million seller. The critics and public alike just adored Eddy's looks, acting, warm personality, and most of all, his singing voice. M-G-M kept Eddy busy. Many of his films played the Chinese: Rose Marie (played in January, 1936), Maytime (played in March, 1937), Rosalie (played in December, 1937), and Girl of the Golden West (played in March, 1938). His Technicolor film, Sweethearts, had just opened at the theatre when Nelson put down his imprints in a Forecourt ceremony. Eddy continued to be a draw for M-G-M with Balalaika (played in January, 1939), Let Freedom Ring (played in April, 1939), New Moon (played in June, 1940), Bitter Sweet (played in November, 1940), The Chocolate Soldier (played in December, 1941), and I Married an Angel (played in July, 1942). Once his M-G-M contract ran out, Eddy moved to Universal for The Phantom of the Opera (released in August, 1943), United Artists for Knickerbocker Holiday (released in March, 1944), and did a multi-tracked recording for the voice of the whale in "The Whale Who Wanted to Sing at the Met" in the Disney omnibus film Make Mine Music (released in August, 1946). Eddy spent much of World War II entertaining troops, both at home and abroad. During the age of television, Eddy made appearances on all of the big variety programs. From 1953 to 1967, Eddy toured in a successful nightclub act. He suffered a cerebral hemorrhage while performing in Palm Beach, Florida; he died a few hours later. He was 65. Grauman's Chinese Theatre, Hollywood, California. 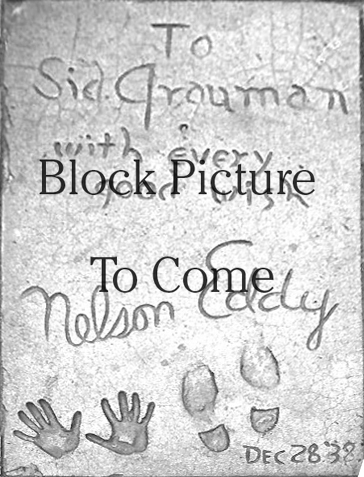 Nelson Eddy Forecourt ceremony, Wednesday, December 28, 1938. 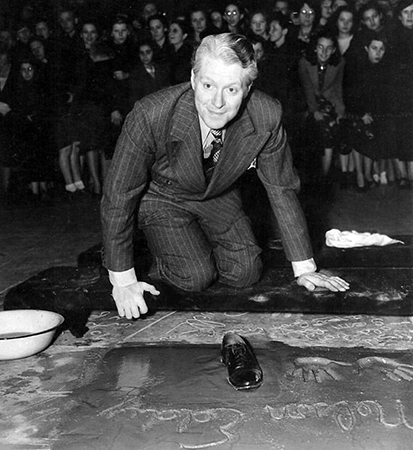 Nelson Eddy pauses between shoe impressions.